By the time we crossed the border into Italy, we’d eaten our way through Portugal, Spain and France. Food was always going to be a big part of the trip, being an aspect of life we enjoy to the full with both of us loving to cook and to try new things. Our aim was to shop locally, buy seasonally and sample local specialities, but we were on the move so much in the earlier part of the trip this wasn’t always possible. We also have to create meals within a tight space and with limited cooking facilities. Although we have always been able to eat well, Italy is the country we have been able to fulfill our aims with the greatest success. Portugal is not known for its cuisine, with its narrow range dominated by bacalhau – salt cod – preserved fish being a staple of the seafaring explorers of Portuguese history. It’s bought in sackloads by every household weekly and we were told that every family has its 1001 ways with bacalhau cookbook. It needs to be soaked for three days before cooking though. Fine for those wooden ships maybe, but not great for a tiny campervan. So we enjoyed a lovely meal of roasted bacalhau at a specialist restaurant. 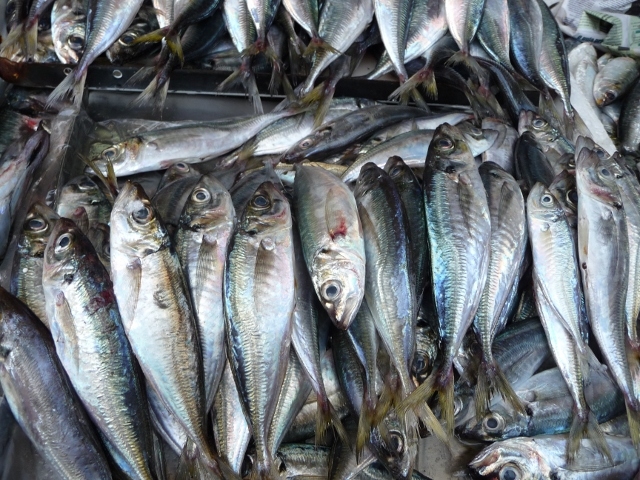 There is other good seafood too of course, especially the sardines popular at the Sao João festival in June. Trying to find a decent lunch snack when not having our own picnics, we came across formulaic menus of rather processed ham or cheese sandwiches. Or you could have ‘miste’ – a mix of ham and cheese. Or really push the boat out and add in a hot dog sausage. 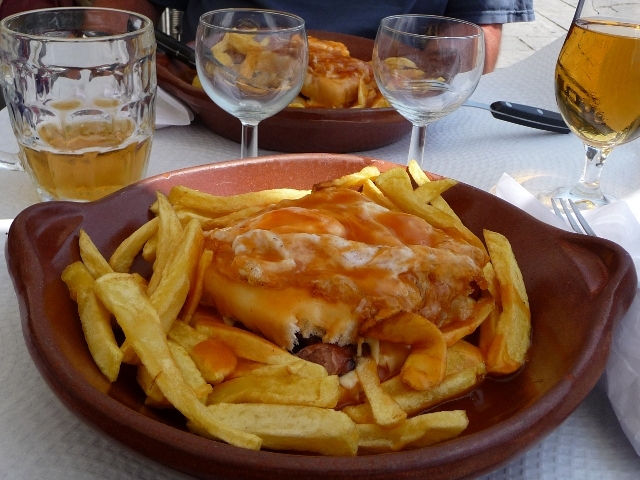 In Porto, the speciality is the Francesinho, a spectacular sandwich of different hams, cheese and sausage covered in tomato sauce and topped with a fried egg and chips. We had to try it of course. Spanish cuisine has much more going for it, and we’re especially fond of the tapas tradition, which we enjoyed to the full in Santiago and Léon. Like Portugal though, the offerings in food shops, even the huge French hypermarket branches there, left a lot to be desired. We were disappointed with the bread in Spain and Portugal too. It may be ahead on bread but in some ways France seems to be resting on its culinary laurels. Disappointing restaurant meals and poor quality produce abound. However, high points were the food market in Puy en Velay and the best crépe ever on an island off the coast of Brittany. So when we crossed the Alps into Italy, we were thrilled to encounter the Italians’ love of their food and their pride in openly sharing their knowledge about it with foreign novices. 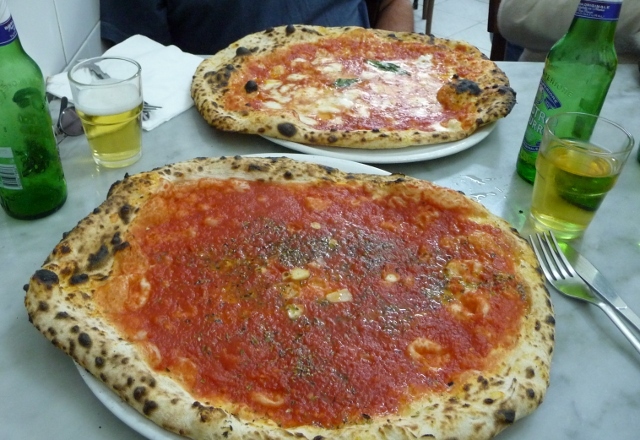 Pizza and pasta have been embraced the world over, but visiting Italy has shown us just what food means to Italians and how their cuisine is perhaps the most varied in Europe. Our first visit to a large Italian supermarket left us incapable of picking what to have for dinner. The quality and variety of fresh produce was the best we’d seen on the trip so far. The choice of fresh pasta alone left us dumbfounded. Stuffed pasta with such a wide range of fillings, we didn’t know where to start. Any amount of fresh sauces and antipasti. We bought far too much because we just wanted to try as much as possible from hazelnut pesto to porcini stuffed tortellini. During the most recent part of the trip, in Southern Italy and Sicily, we have slowed right down and spent longer periods in one place. This has allowed us to discover more hidden away local shops and markets, and build relationships with the butcher, the baker, the deli counter staff and the stallholders with our faltering attempts at Italian. We see them often as we tend to shop every day (sometimes twice a day when the fridge was down). There is an abundance of fresh fruit and veg stalls everywhere and we have followed the seasons from late late summer into the beginning of winter and seen the changes in what’s on offer. 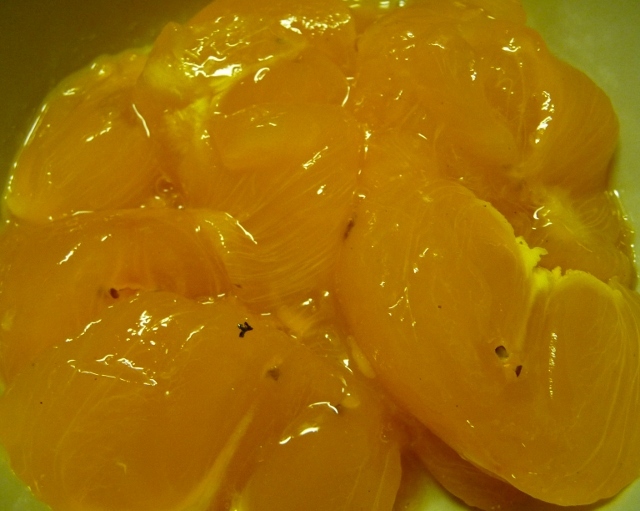 There are lots of new things we’ve never tried before, for example ‘loti’, also known as ‘kaki’ are persimmons in English – a sweet orange fruit, a variation is the ‘melekaki’ a cross between a persimmon and an apple. 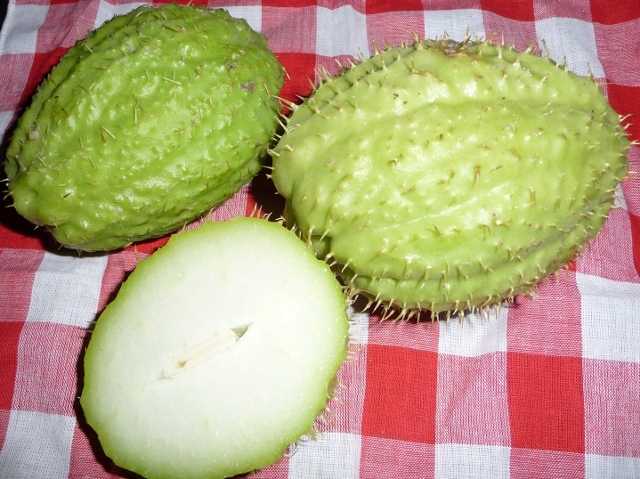 The fico d’India cactus fruits have also been piled high this autumn, and we’ve seen the cactus orchards too. There are lots of different green leaf vegetables tied in bunches, and fierce spiny courgettes (see below: the inner flesh has the texture of potatoes raw and when cooked) as well as types of fish we had no clue what to do with. 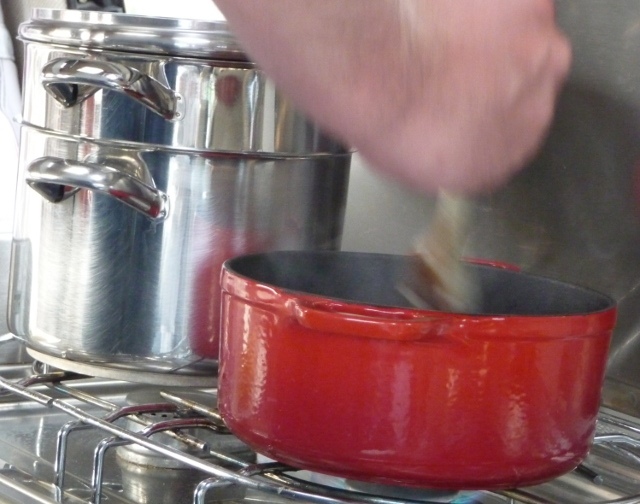 No problem – the vendors will tell you how to prepare and cook them. Sometimes other customers join in and tell you how they cook it and there will be plenty of discussion and the characteristic gesture of rubbing a knuckle into the cheek to indicate ‘yummy’. What better incentive to help us learn and improve our Italian! Our friend Jenny introduced us to another Italian treasure not so common now – the fresh pasta shop. Here you can buy pasta from the local speciality shapes to ravioli filled to order, all made on the premises. If you want papardelle (the one that’s double the width of tagliatelle), they get sheets of lasagne and cut it to size. 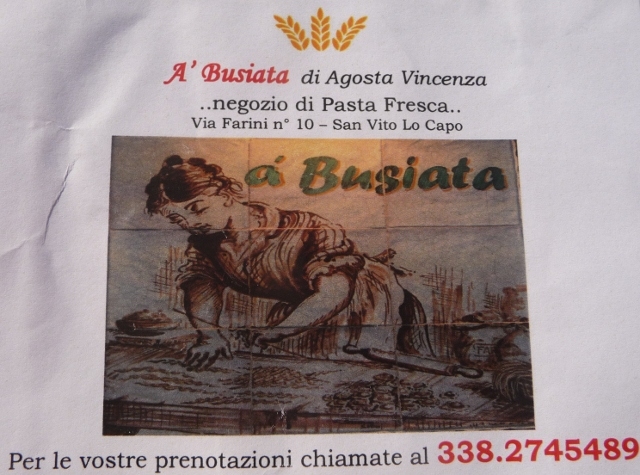 Enough handmade fresh pasta for two portions – and then some – for two euros. More for filled of course, depending on the filling. We’re getting used to the markets where you ask for a quantity and end up with much more than you requested, sometimes for free, sometimes not. Because of a tiny, and at times not working, fridge, we ask for apparently embarrassingly small quantities. At the market near Tropea, I picked up a handful of the pretty miniature red peppers an old man was selling … it was too small an amount for him to charge me, he said. The Italian staples of pasta, gnocchi and risotto especially lend themselves to cooking on two rings, and have infinite possibilities when it comes to ingredient combinations both traditional and made up on the spot. Couscous is also a very useful staple both in preparation – it doesn’t even need a ring – and in what you can eat with it. It’s a local speciality here on Sicily with its Arab influences. We tend not to do much frying because of fat spitting and fumes in such an enclosed area, so we’ve been missing sausages. Jenny cooked us a pasta dish with the local fennel flavoured sausage meat prised out of its skin and cooked with other ingredients. This has now become a regular addition to pasta sauces or to the risotti we’re so fond of. 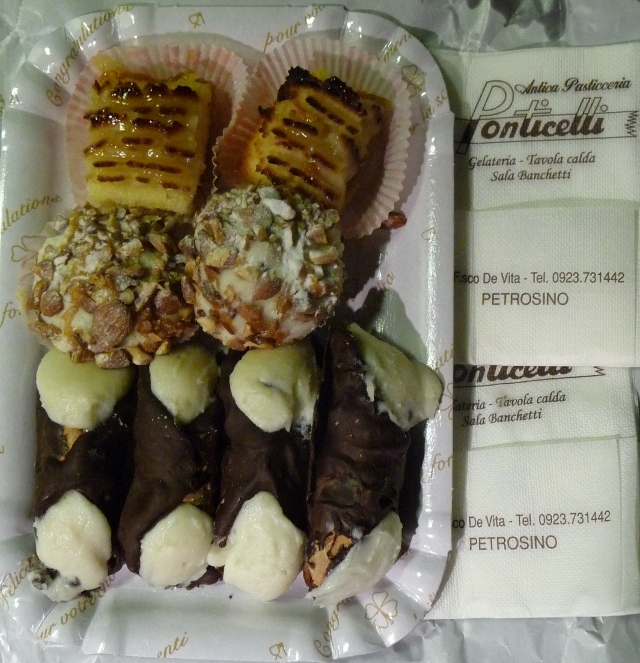 The celebration of the local ‘produtti tipici’ of different regions tempted us to try truffles in Umbria, local wines from Montalcino in Tuscany to Sicily’s Nero d’Avola, and of course Sicily’s famous cannoli – small crispy pastry tubes filled with ricotta and sprinkled with chopped pistachios, and other pasticceria goodies. We’ve also been sampling a variety of local liqueurs from Mandarinetta to Limoncello. 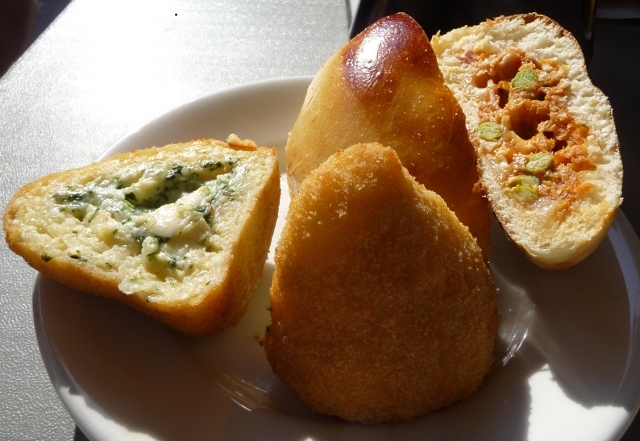 Then there are the different varieties of arancine – or rice balls. Made in Sicily from the 10th century onwards, these consist of rice moulded round a tasty filling, say spinach and ricotta, or meat ragu for example, and then bread crumbed and deep fried – a lovely change for a lunchtime snack. In each of these countries though, it is their own cuisine that dominates. Ingredients and restaurants beyond this tend only to be available in larger cities. We search out local ethnic grocery stores and street markets for Indian spices, fresh ginger and other ingredients for our stir fries and curries. Fresh milk is the one surprising thing that is more difficult to find, although it has been more widely available in Italy. There are aisles given over to UHT milk in France, Spain and Portugal, and just a small shelf of fresh milk offered in the chiller cabinet and sometimes not at all. The things we might miss are outweighed by the new things we are discovering though. Meat has generally been of very good quality across the countries we’ve travelled through. Cuts of meat are different, and are usually sliced quite thinly here in Italy. We’re missing lamb though – it’s been very expensive throughout the trip and has not been freely available here in Sicily. We did get some lamb ribs recently, which we pan cooked in a borrowed big frying pan. As our Italian improves we are getting better at asking for what we want from the butcher rather than buying pre-packaged meat. And if he doesn’t have the particular slab of meat on his counter, he will go and fetch a carcass from his cold store and cut off the required amount. This would make some people squeamish, but here it feels as if you are getting nearer to the source of your food. We recognise that the food we were used to in the UK, is so varied, luxuriant and international that we’d become very spoilt. You can get formerly seasonal vegetables and fruit at almost any time of year. If you choose, you can have green beans from Zambia, asparagus from Peru and avocados from Israel in just one shopping basket … far removed from when these items are in season in England or even in Europe, if they ever were. The drive towards healthier eating and superfoods means we now expect and crave blueberries and pomegranates and any amount of hitherto unknown grains and greens in our salads year round. When we flew back to the UK from Lisbon back in July, we were almost overwhelmed by the choice in just one lunchtime food aisle in Marks and Spencer. In spite of the variety and quality of food in the UK, British cuisine is only now being appreciated once again. However, there is that discussion about what British cuisine actually is. In the south-east of England at least we have no discernible regional specialities. I can’t think of any specific cake, cheese or sausage from our area, for example. We’re likely to take foreign visitors for a Brick Lane curry for an authentic eating experience. We do have a wealth of regional and local beers that actually taste different from each other though. European lagers really differ very little one from another and there are few local breweries. We are not missing much from home, but what we do miss most are the beers, and oven cooked dishes, like pies and roasts (we’ve had roast potatoes twice in six months – those of you that know us well will know just how much we miss them!). 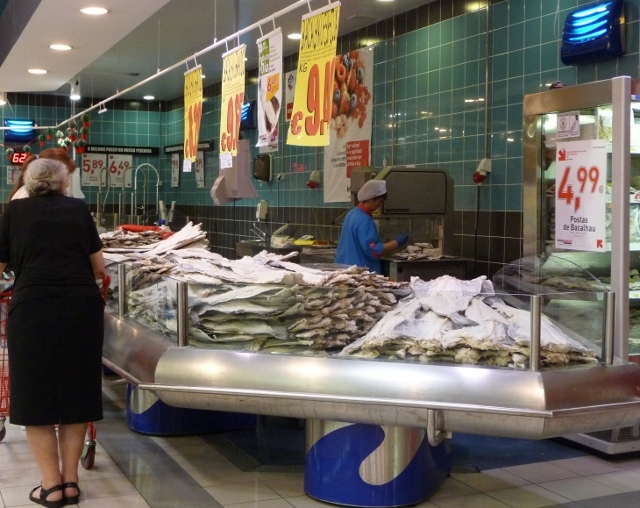 In larger supermarkets you can find a few overpriced things on the ethnic food aisle. It is amusing to look at the British shelves. They usually have familiar brands of Marmite, custard powder, canned steak and kidney puddings, and baked beans if you’re really that desperate. Now our taste buds are looking forward to the change in cuisine that crossing over to North Africa will give them. This entry was posted in Food stuff, Personal stuff. Bookmark the permalink. 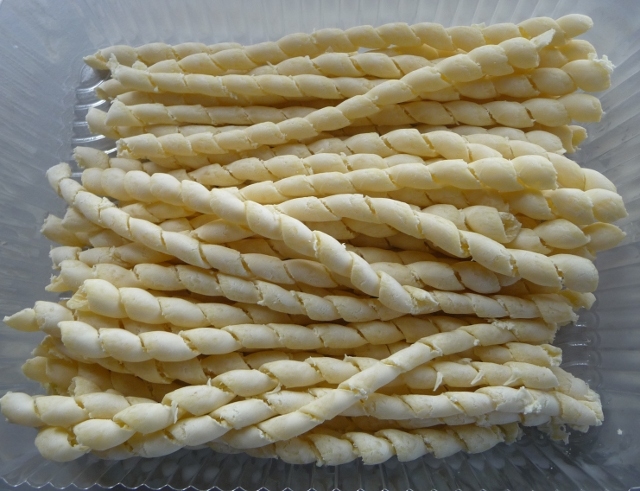 Now I’m VERY HUNGRY especially seeing the pictures of the pastries….! Thanks for reading and for your lovely response – I think this whole subject is fascinating. We are spoilt on the one hand but lose out on the other with what’s available! Buon apetito.